I ran across this quote by C.S. 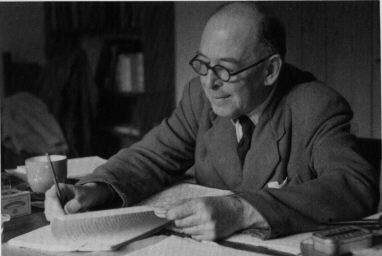 Lewis on the nature of scripture, more specifically the New Testament. In 1997-1998 I had the privilege of spending a year in Jerusalem. The institute where I was studying is located on Mount Zion in what used to be the Bishop Gobat school. It also contains one of the few protestant cemeteries in Jerusalem. The cemetery was a fun place to walk through if you are interested in history. Among its famous residents is the Spafford family best known for Horatio Spafford's hymn "It is well with my soul." Another famous resident is Sir Flanders Petrie. Petrie is a famous archaeologist from the late 19th early 20th centuries. 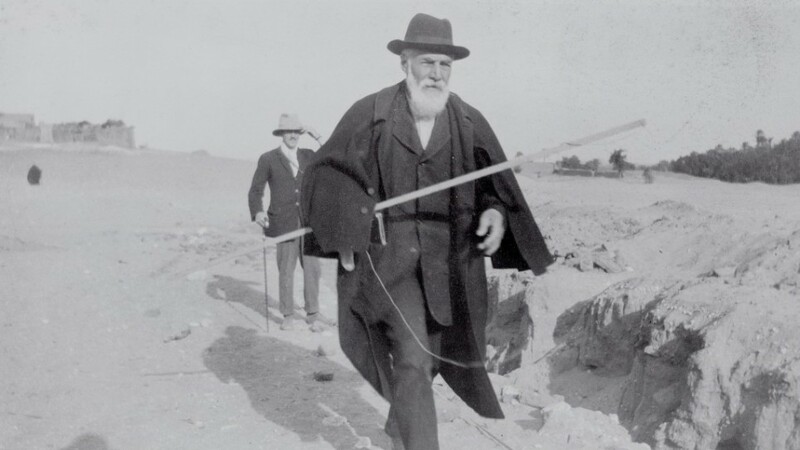 He was a bit of a British Indiana Jones In many ways he is one of the fathers of modern archaeology. The shift from digging trenches to squares and looking at the different layers was first proposed by Petrie. And, if I am not mistaken, he may have been among the first to realize that pottery could be used for dating a layer. Petrie, was also very eccentric and he had some ideas about eugenics that wouldn't wash today.But that is what makes his story have such a fascinating ending. Petrie donated his head to science and when he died it was cutoff and sent to London. I remember my archaeology professor telling me the story when I was in class in Jerusalem. I think he noted that because of WW II Petrie's head was stored in a jar under a bed until it could be shipped. Once it go there though, it was mostly forgotten until another archaeologist went looking for it. The assistant opened Petrie’s eyes, Gibson recalled. They were blue.“Though I was born only 16 years after his death, I like to say that I met Flinders Petrie,” Gibson said. You can see a picture of Petrie's head here at the Tabor Blog. You can read the whole article here. It provides an interesting look at one of archaeology's more unusual characters. I have watched, but not participated in the most recent furor over what some are calling biblical marriage. I say biblical marriage rather than gay marriage since, as far as I can tell, Dan Cathy never said anything about gay marriage specifically. He said that he supports the "biblical definition of the family unit." A "biblical interpretation" would not only exclude gay marriage, but also divorced people, single parents who were never wed and in some cases the widowed. So in reality, the unintended effects of Cathy's statement are much wider than he or most people probably realize. As I said, I have avoided the topic on here and I also didn't eat at a Chick-Fil-A yesterday in support nor will I boycott one. I generally eat at home (healthier and cheaper), and I have no clue where the nearest Chick-Fil-A is located. But my colleague here Ashland Seminary, Allan Bevere has some good thoughts on the dustup and how Christians should respond. Here is some of what he has to say. I am not a fan of boycotts nor am I interested in anti-boycotts. I have not eaten at Chic-fil-A in years only because I am no longer at the age where I can eat anything I want. If I did my doctor would be none-too-happy with the results of my blood work. Having said that, if I ever had a hankering for a fat loaded, sodium laden chicken sandwich, I wouldn't hesitate to stop at Chic-fil-A. But neither did I consider stopping at the restaurant yesterday-- not only because there is no way I would wait in line for two hours for a fat loaded, sodium laden chicken sandwich, but also because I don't like the message Wednesday's anti-boycott sent anymore than the boycott itself. I refuse to allow people to turn what I eat and drink into a political statement. If I want a Chic-fil-A chicken sandwich, I am going to eat one regardless of the company's views on marriage. If I want a Starbucks coffee, I am going to get one regardless of their views on marriage, which are very different from Dan Cathy's perspective. Anyone who concludes what I think about any issue by what I am shoving in my mouth has an ignorance rate higher than my cholesterol level. You can read his whole post here and please let him know you stopped by. What have the Christians ever done for us? In some corners there are those who suggest the religion has never done anything positive for the world. Not surprisingly, this has focused on Christianity in those countries where it has dominated. The Centre for Public Christianity did a three part series on the legacy of Christianity looking at contributions to art, music, architecture, charity, and human worth. The links for the three podcasts are below. Remains of First Century Jews in the Temple Mount? This past weekend Jews around the world observed Tisah B ' Av, the day that both temples were destroyed. The first temple was destroyed in 586 BCE by the Babylonians and the second temple by the Romans in 70 CE. While there are few who will claim that these temples never existed, there is also very little archaeological information. The site is a Muslim holy site and has been since the seventh century with some interspersed Christian activity. 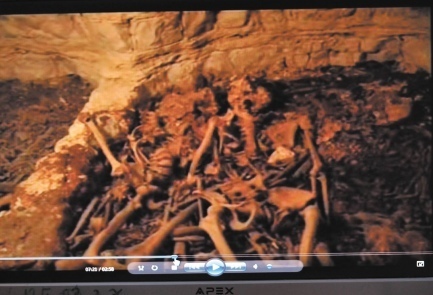 Coincidentally, a journalist, Benny Liss, has released a video he took of a cavern under the temple mount that contains a mass grave of skeletons. Liss is suggesting that these are the bones of Jews killed by the Romans when they took the temple mount in 70 CE. According to Josephus, the Romans first entered Jerusalem through the temple complex and then eventually attacked the upper city. Liss suggests that the mass grave is evidence of a Roman massacre of Jews on the site. Archaeologists, however, are not so sure. Here is what they are saying. This does sound like an interesting find, but without the ability to study the bones and the cavern it is impossible to know what it all means. The times is, of course, interesting. A pile of bones in the temple mount, which no one can access, is announced as being evidence of the Roman conquest all on the day Jews observe the temple's destruction. Remember Harold Camping? Remember the Mayan calendar? Remember the one time the world really did almost end with Noah and the ark? Well apparently they are coming together in Holland. 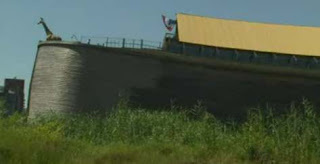 According to Sky News, a Dutch gentleman, Johan Huibers, is building an ark in Holland because he had a dream that the whole country would be flooded. So he has built a replica of Noah's ark with a mixture of real and fake animals. They were invited to sail to the London Olympics, but had to cancel. At the same time, those who think the world is going to end this year are trying to book rooms on the ark in hopes of being saved. Here's a video clip of the story. Perhaps Huibers has never heard about the Dutch boy who stuck his finger in the dyke? In the mean time, Huibers is preparing for his next project which is pump water from the Mediterranean Sea to the Dead Sea. 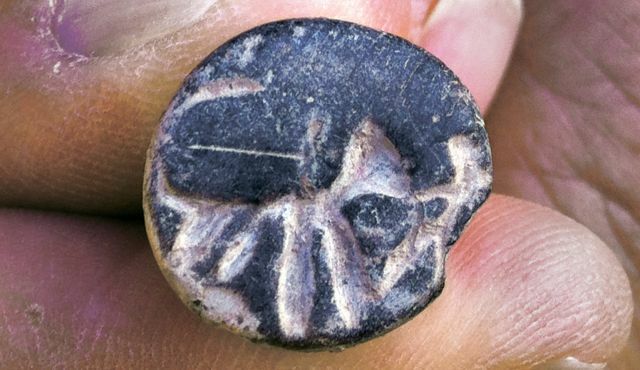 A seal has been discovered at excavations in Beit-Shemesh, which is not far from Tel-Gezer where I have been taking students to dig the last few years. According to Judges 14 and 15, Samson was from Zorah and his wife from Timnah. Beit-Shemesh was located in the same area between the two cities. Archaeologists have uncovered a seal depicting a man with a large animal. 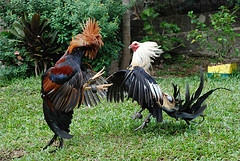 Some say it shows Samson fighting the lion (Judges 14:5-6). Here is what they are saying. At this point I will withhold judgment since I am not there, nor am I am expert in this area. But I will note that the seal could also be of a horse and his boy, or a man and another animal. In other words, I am not sure this can be connected to Samson. I am glad the archaeologist are also being cautious. Read the whole story here. For a piece on a mosaic recently discovered that does depict Samson, go here. Where I live in Ashland, Ohio we have lots of interaction with the Amish. I buy their vegetables at the market , watch their buggies pass my house as they head to Aldi and Walmart, and I may even wait in line behind one at the bank. But I had no idea that they were the fastest growing religious group. And apparently it is not due to conversions, but births. According to recent census information they are taking the "be fruitful and multiply" command very seriously. A new census estimates that a new Amish community is founded every three and a half weeks in North America and they estimate that nearly 60% of these communities were founded after 1990. 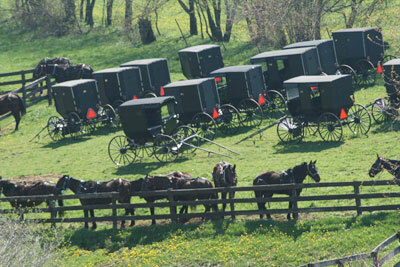 The census restricted the count to Amish who refuse or limit modern amenities, such as electricity and automobiles. The researchers who compiled the census used a variety of sources to produce this count, including current and archival settlement directories and statistics from publications that cover some of the largest Amish communities, as well as by calculating estimates based on research-based facts about Amish settlement characteristics. Those are some pretty startling figures. At that rate we will be the United States of Amish in a few years.